Page first publish on Aug 30, 2016. Page modified on May 15, 2018. The Soliloquy departs from the conventional 2-way in that it is an “Inverted” tower. By this, I mean the woofer is on top and the tweeter is below. The reasons for this will become apparent as we go along. Fig 1 – Tang Band W5-1685 RAW and 12dB frequency response. Mic at 1 meter. Impulse Window = 5ms. No Smoothing. Disregard measurements below 500Hz as they include room reflections. The Black plot in Fig 1 is the RAW response of the W5-1685. 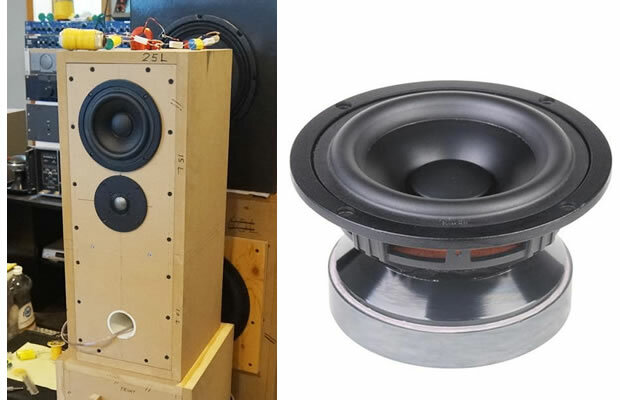 It is quite unusual for a woofer that’s essentially optimize for bass to have an extended frequency response like the W5-1685. The Blue plot is with a 2nd order electrical filter at a corner frequency of 2,300Hz. Fig 2 – Seas 27TBFC RAW and 12dB frequency response. Mic at 0.5 meter. Impulse Window = 5ms. No Smoothing. The Black plot in Fig 2 is the RAW response of the Seas 27TBFC measured on-axis. The Red plot is with a 2nd order filter with a corner frequency of 2,300Hz. Fig 3 – Frequency Response of W5-1865 with Low Pass filter and 27TBFC with High Pass filter. Fig 3 shows the frequency response of the two drivers with their respective filters. It is clear from their asymptotes that they are both 2nd order networks. It is refreshing working with such friendly drivers. The W5-1865, in particular, rolls off without any nasty peaks, simplifying the crossover in the process. Fig 4 – Summed Response of Tang Band W5-1865 and Seas 27TBFC. Mic at 1 meter. Impulse Window = 5ms. No Smoothing. The Black plot in Fig 4 is the summed response of the W5-1865 with the 27TBFC with the microphone on the W5 axis. The Red plot is with the microphone lowered to the 27TBFC axis. Comparing the two plots, it is obvious that the high frequencies are smoother on the W5 axis. Hence the “Inverted” placement of drivers. Fig 5 – Mic at 1 meter. Impulse Window = 5ms. No Smoothing. The Black plot in Fig 5 is the final frequency response of the Soliloquy. This is with the 27TBFC tweeter wired in Reversed Phase. The Violet plot is with the tweeter wired back to normal phase. Note the deep null at about 2,300Hz. I find the Soliloquy very soothing to listen to. There’s no hint of aggressiveness. The mids don’t shout at you. At the same time, they are not lost in the background. Vocals remain clear and transparent. The treble is excellent. The Seas tweeter is incredible. It’s extremely detailed, exhibiting no graininess. Surprisingly, these tweeters need to be broken in first. Otherwise, they sound a bit metallic. For best results, I recommend low stands of 15″ ~ 17″ height. This will raise the mid-woofer to near ear level when you’re seated on a sofa. If possible, keep them about 3 feet away from the back and side walls.